We’d love your help. Let us know what’s wrong with this preview of Lightspeed Magazine, September 2017 by John Joseph Adams. This month, we have original science fiction by Timothy M LIGHTSPEED is an online science fiction and fantasy magazine. In its pages, you will find science fiction: from near-future, sociological soft SF, to far-future, star-spanning hard SF--and fantasy: from epic fantasy, sword-and-sorcery, and contemporary urban tales, to magical realism, science-fantasy, and folktales. To ask other readers questions about Lightspeed Magazine, September 2017, please sign up. Among the original fiction, there were two very good stories here. 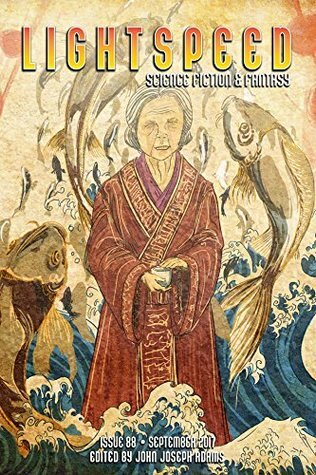 The best of them is Jaymee Goh's "The Last Cheng Beng Gift"(****), a charming and entertaining fantasy about a woman "living" her afterlife in the underworld, who receives annual gifts from her still living children. She hates the gifts she receives from her daughter, and finally decides to take a trip back to the living world to haunt her. Goh does and excellent job of establishing her protagonist and the otherworldly setting, a Among the original fiction, there were two very good stories here. The best of them is Jaymee Goh's "The Last Cheng Beng Gift"(****), a charming and entertaining fantasy about a woman "living" her afterlife in the underworld, who receives annual gifts from her still living children. She hates the gifts she receives from her daughter, and finally decides to take a trip back to the living world to haunt her. Goh does and excellent job of establishing her protagonist and the otherworldly setting, and though the ending is a tad predictable, it is still welcome and emotionally satisfying. Nearly as good is Giovanni De Feo's "Ugo"(****), the story of a man (the titular Ugo) who can "travel" to inhabit his own body at earlier points in his life. He can interact with the past as his future self, but changes cannot be made without severe consequences. He tells his future wife, Cynthia, about his strange power when they are both children, and it affects the way she views her own future and even her own identity. The reader figures out Ugo's grand scheme well before Cynthia does, and while this sort of thing is often a frustrating conceit, it works here. The author employs an odd narrative device in which Cynthia creates a separate identity (Cinzia) for herself when she is with Ugo. It adds an interesting dimension to the story at first, but after the "twist" ending, it feels like a bit of a cheat. Not bad enough to kill an otherwise terrific tale, thankfully. The other two original stories are less successful. Timothy Mudie's "An Ever-Expanding Flash of Light"(***) uses time dilation in a similar fashion as The Forever War - in this case a soldier, Tone, keeps signing up for more year-long tours while hundreds of years pass on earth. His hope is, one day, science will be able to cure his hibernating wife (Irena) of cancer, but every year he returns to Earth and no progress has been made. It's a compelling concept with some nice touches, but it doesn't work as science fiction. A thousand years go by over the course of the story but there is no indication that any changes to the cultural or political landscape have any effect on his job as a soldier or his wife's status on earth, so the whole concept feels underdeveloped. The ending is sweet, but the overall story is a little flat. "A Pound of Darkness, A Quarter of Dreams"(**) by Tony Ballantyne is the only real dud in the group. It involves a grocer who must make a deal with a demon who traffics in souls to keep her shop open. The whole concept is shoddily conceived - it's the kind of story that needs to keep changing the rules of its premise to move forward. The characters are uninspiring, and the prose aims for a whimsy that feels forced. This was an excellent issue, a rare one with no duds at all. My favorites were "Blue Ribbon" by Marissa Lingen, "The Last Cheng Beng Gift" by Jaymee Goh, "The Magician's Apprentice" by Tamsyn Muir, and the novella reprint "Near Zennor" by Elizabeth Hand (I probably shouldn't have read that one at night... with the darkness outside my windows). Another Levar Burton Reads offering. I really liked this one. The MC, while not overly sympathetic, does learn and it was a satisfying ending for me. 4 solid stars. Since JJ Adams also publishes Nightmare Magazine, I don't understand why he insists on polluting the pages of this magazine with horror stories as well. Isn't there any non-horror fantasy out there anymore? Spirit of dead Chinese mom still doesn't understand her kids. Interesting app Since JJ Adams also publishes Nightmare Magazine, I don't understand why he insists on polluting the pages of this magazine with horror stories as well. Isn't there any non-horror fantasy out there anymore? An ok story about what is truly important in this life...and the next. I liked the core ideas of this one and the main characters had a solid depth to them, but the story as a whole needed more time to breathe. All the big emotional points seemed rushed and almost glossed over, although in part this was down to the narrator's need to seem in control and not panicking. There's a fairly sweet story in here about making the most of the time you have and not putting things off while you hope for a miracle. Unfortunately, so much of the writing is flat caricatures and dull "you're in the space army now" clichés that it has no hope of connecting. Compellingly opaque on its central mystery of the alien message, supposedly beautiful to hear and demanding no wars until its senders return, this deals with sequential cloning, those in power keeping secrets from the majority for the greater good, and whether that is or can be worth it. Nothing is really spelled out and the surface plot doesn't fascinate, so much of the interest is in reading into what is there. This ended up somewhere completely different from where I had thought it was going; for most of it I was torn between thinking Ugo was being manipulative and abusive to Cynthia/Cinzia and feeling sympathy for his impossible situation - on reflection, both feel valid. Then the final section stripped out the fantastical element (with a nod to the possibility that it remained) and the tension deflated. The study of a character stuck in Ugo's time-leaping predicament was far more interesting to me than bringing it back to a potential real-world explanation. An interesting portrait of the overbearing matriarch wanting a very specific "best" for her children and continuing that attitude into the afterlife. Touches of humour and pathos without either dominating. Enough nuance for there to be some understanding reached by the end while retaining her self-centred motivations. For most of its length this is cheery and light, even when discussing heavier topics like a deadbeat dad or a car crash, and then it takes a hard left. That abrupt shift in tone retroactively becomes the point of the preceding sections and takes away the importance they had on their own. At the same time, there does not appear much justification for the twist within the story's world. It has a shocking impact at first but, on reflection it reduces the story as a whole. A shopkeeper's take on the deal with the devil, playing a game or contest for their soul. Having the demon be a representative from a larger business leaning on the small shopkeeper plays nicely. I wasn't sure about the way the contest was won but it fit the story's theme. Nothing outstanding but a fun enough spin on a familiar tale. Lovecraft riffs in general feel awkward, wanting to be light-hearted but maintain some element of fear, rarely finding that balance. The idea of someone/some AI diverting traffic to draw out the summoning was clever and a nice modern day touch. This story is so lovely. If you’re here, and you’re following my reviews, thank you for rolling with me. We’re on episode 27 of Stitcher’s LeVar Burton Reads, and we’re gifted with “The Last Cheng Beng Gift” by Jaymee Goh. LeVar really broke this one down for me, there’s almost nothing I can add. This is one of the best stories. I can see myself coming back to it later. It’s just so personal. I think lots of people will read this and see their own parents, their own childhood. People will see their unresolved conflicts with loved ones that have moved on. People will see their deeply-ingrained mannerisms that developed around stress or trauma, their own misunderstandings and miscommunication. There’s something really playful and fascinating about giving gifts in an afterlife. It almost makes fun of how little we need these things in our actual lives. It’s just stuff, but we make it important. Sending gifts into the afterlife challenges the soul to look at them in other ways. The gifts aren't much at service for what they do. They're used for saying something. Mrs. Lim said the fish were supposed to nibble away at old skin, but she didn’t have any old skin. So what was the point? Hong Yin wasn’t trying to send her mother a spa. She was trying to tell her mother something. The repetition of the fish spa, was just a girl repeating herself over and over to someone that hadn’t heard the message yet. Thanks for reading, and If you wanna chat about the latest LBR episodes, hit me up in the comments and come meet up with us at LeVar Burton Reads: The Community on Facebook. An interesting story into a culture that fascinates me (being a small part of my family heritage that is unknown to me). The mother is a bit standoffish, and traditional, but later comes to just wanting her children to be happy. She seems to finally be proud of her daughter in the end, and can move on from the afterlife. Beautifully told, both in details and writing by the author, and from Levar narrating. A story about a mother who loved her children and wanted the best for them and did what she thought was the best, but didn't really understand her daughter. There's a lot of quiet humour in the story and the way the world of the dead is described, which was also fascinating to read about. And I liked that we got the mother's perspective. There are lots of stories about children being at odds with their parents, but it's almost always from the child's point of view. Everything in this was a solid 3-4 stars so I can't say I didn't enjoy or get something out of all the stories. I think the stand outs were definitely Blue Ribbon by Marissa Lingen, The Last Cheng Beng Gift by Jaymee Goh, and Carthago Delenda Est by Genevieve Valentine. I would honestly read entire books based off those three. Like I said everything in this was solid though. Definitely one to pick up if you like the magazine. I really liked this story to see how different cultures do different things to remember family is neat. This is the story about the older generation not getting the younger but later coming to love them anyway. This story was read on one of LeVar Burton’s podcasts and it was fascinating to read a story that allows you to get a glimpse of another culture. I really loved the short stories in this issue.I have subscribed to this magazine since May. The reason i did not give it 5 stars is because i did not enjoy the books reviewed at the end. So good. Such a fun and lovely story about family, life, death, and what matters most. It's a very light-hearted take on what can be a very dark and dreary topic!